Decorate your space with photos! Print, peel, and stick! Removes easily. Decorate your space with your favorite social media photos. Print from your smartphone or tablet with HP’s app and stickable 4 x 5-inch photo paper for snapshots you can stick and remove easily. Easily print photos from your smartphone, then stick to decorate. Removes easily! 1 Local printing requires mobile device and printer be on the same network or have a direct wireless connection. 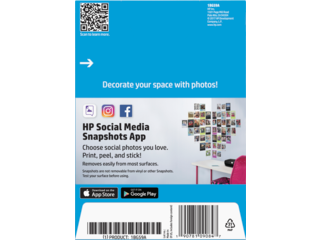 Mobile printing from the HP Social Media Snapshots app is supported on iPhone®, iPad®, and iPod touch® using AirPrint® on iOS v7.1 and higher. Android™ printing supported on Android devices using OS v4.4 and higher and may require the installation of a printer service plug-in from Google Play™. For details on how to print, see http://www.hp.com/go/mobileprinting. AirPrint, Apple, iPhone, iPad and iPod touch are trademarks of Apple Inc., registered in the US and other countries. Android and Google Play are trademarks of Google Inc. 2 Google Play is a trademark of Google Inc. Apple, AppStore and the Apple logo are trademarks of Apple Inc., registered in the U.S. and other countries. 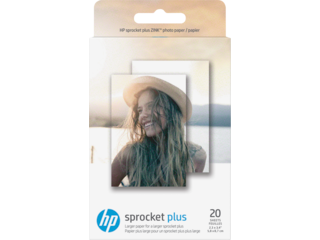 Instantly turn your favorite moments into 2 x 3-inch (5 x 7.6-cm) smudge-free, colorful snapshots or stickers, exclusively for HP Sprocket and HP Sprocket 2-in-1. Turn your favorite photos into shareable fun. 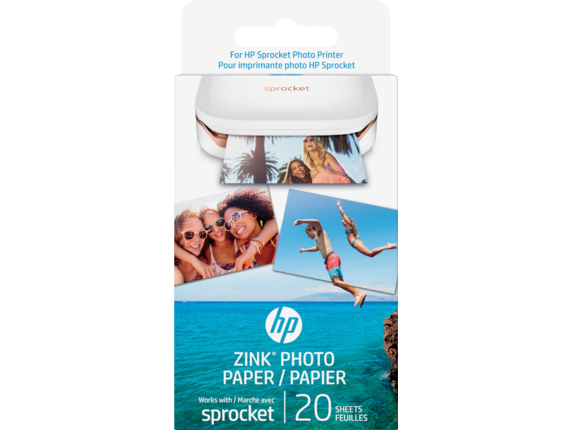 Easily print instant photos and stickers from your HP Sprocket or HP Sprocket 2-in1.. Not compatible with HP Sprocket Plus. 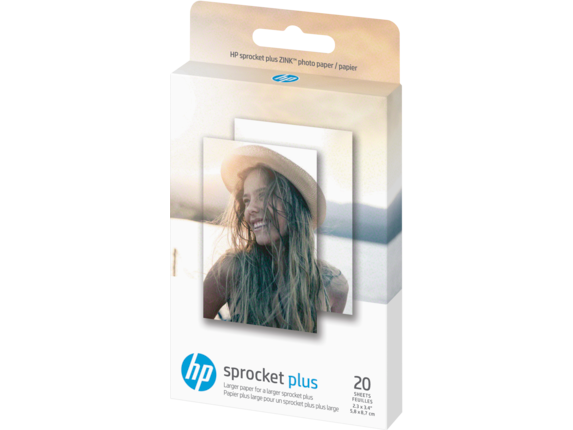 Ideal for printing and sharing instant photos in the moment using the HP Sprocket or HP Sprocket 2-in-1. 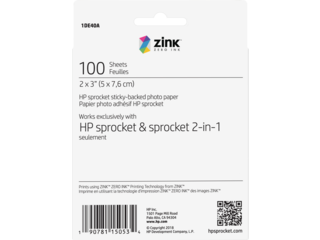 1 Water, tear and smudge resistance based on internal testing by Zink Holdings, LLC. 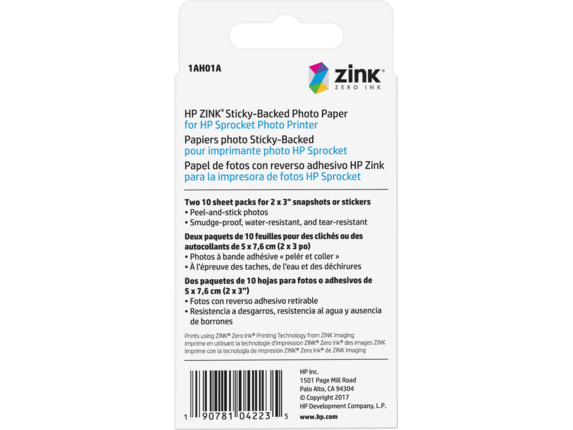 The ZINK Technology™ and ZINK Trademarks™ are owned by ZINK Holdings LLC. Used under license. 2 HP Sprocket app required. 3 The ZINK Technology™ and ZINK Trademarks™ are owned by ZINK Holdings LLC. Used under license. Turn your favorite moments into instant 2.3 x 3.4-inch (5.8 x 8.6-cm) smudge-free, colorful photos or stickers, exclusively for HP Sprocket Plus. Expand the experience with larger photos. Turn your favorite moments into shareable fun with instant photos and stickers from your HP Sprocket Plus. Not compatible with HP Sprocket or HP Sprocket 2-in-1. Ideal for printing and sharing larger instant photos in the moment using the HP Sprocket Plus. 1 Compared with HP Sprocket Photo Printer. 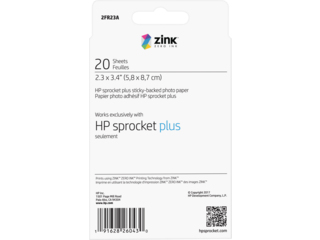 2 Water, tear and smudge resistance based on internal testing by Zink Holdings, LLC. 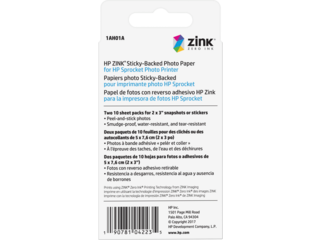 The ZINK Technology™ and ZINK Trademarks™ are owned by ZINK Holdings LLC. Used under license. 3 HP Sprocket app required. 4 The ZINK Technology™ and ZINK Trademarks™ are owned by ZINK Holdings LLC. Used under license. Print true-to-life photos with rich, vivid colors and an impressive finish. Photos dry instantly so you can pass them around—right from the printer—without smudging. 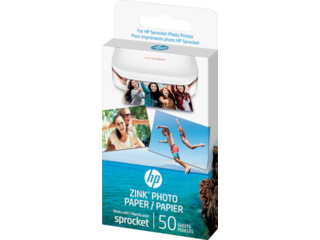 Print water-resistant photos with instant dry time while enjoying store-processed print quality. 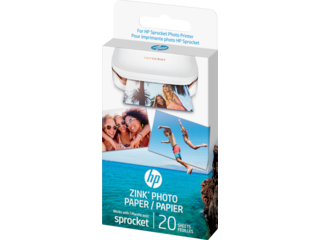 For customers who value instant-dry, water- and smudge-resistant photos with true-to-life color. Print photo projects affordably at home. Print photo projects on thick, quick-drying photo paper. Print colorful, everyday photo projects for a low cost, using recyclable paper. This glossy paper dries quickly and can be used with any inkjet printer. 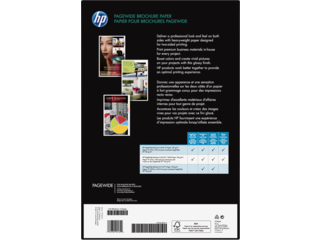 Use HP Photo Creations software to create photo cubes, newsletters, calendars and more. Print photo projects affordably, using glossy, recyclable paper. Share fun prints with friends and family. Customers who value instant-dry, water- and smudge-resistant photos with true-to-life color. 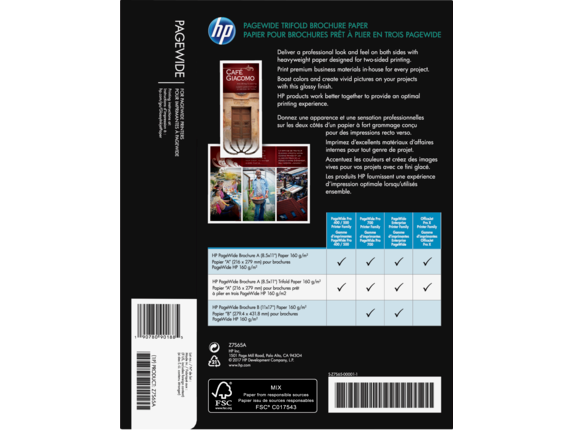 1 Display permanence rating by HP Image Permanence Lab; results vary by ink. 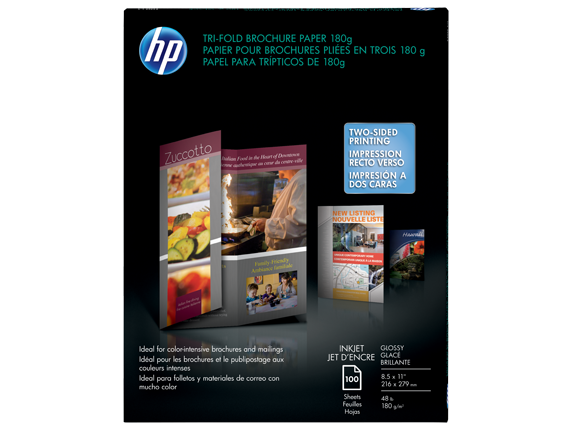 For details visit http://www.hp.com/go/printpermanence 2 Printing with HP photo ink cartridges or HP 110 Tri-color Inkjet Print Cartridge with Vivera Inks. For more information on water resistance, please visit http://www.hp.com/go/printpermanence. 1 When using Original HP inks. Display-permanence rating by Wilhelm Imaging Research, Inc., or HP Image Permanence Lab. For details, visit http://www.hp.com/go/printpermanence. 2 Paper may not be recyclable in your area. 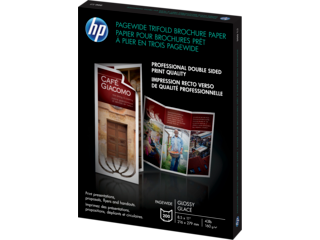 The easy way to produce professional quality three-panel brochures using your inkjet printer. It is pre-scored for precise, easy folding and is 48-lb. bond (180 g/m²)—like the stock print shops use-so your brochures feel and look impressive. Produce print shop-quality, tri-fold brochures. 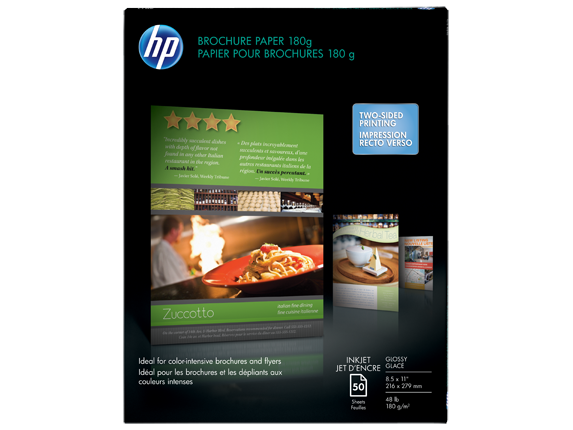 Produce image-rich, tri-fold brochures that rival professional print shops in cost and quality. 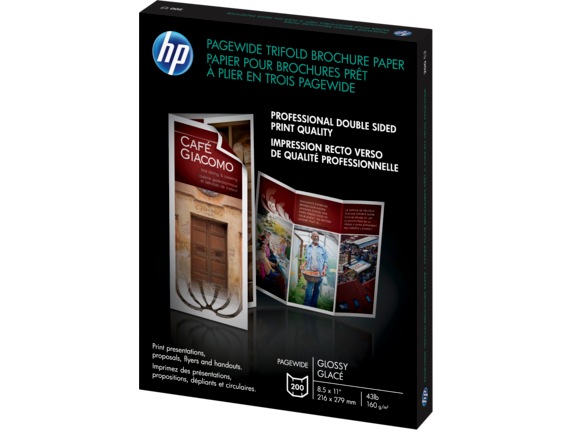 HP Tri-fold Brochure Paper features a bright-white finish and glossy coating for crisp text and vivid colors, using HP inkjet printers. Print gallery-quality photos with rich, vivid colors and a glossy finish. Photos dry instantly, so you can handle them right from the printer without smearing. Ideal for framing, photos resist fading for more than 200 years. Professional photographers and serious amateurs using HP Photosmart Pro B9180 and DesignJet Z2100 and Z3100 printers to create photos for sale or exhibition. 1 Based on preliminary display permanence testing under glass by Wilhelm Imaging Research, using HP 38 Pigment Ink Cartridges. 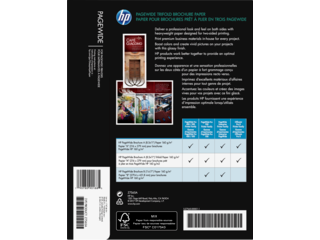 For details, see http://www.hp.com/go/printpermanence 2 Printing with HP photo ink cartridges or HP 110 Tri-color Inkjet Print Cartridge with Vivera Inks. For more information on water resistance, please visit http://www.hp.com/go/printpermanence. Ideal for small home- or office-based businesses that are looking for efficient, in-house, cost-effective solutions to give their printed materials a professional look and feel. 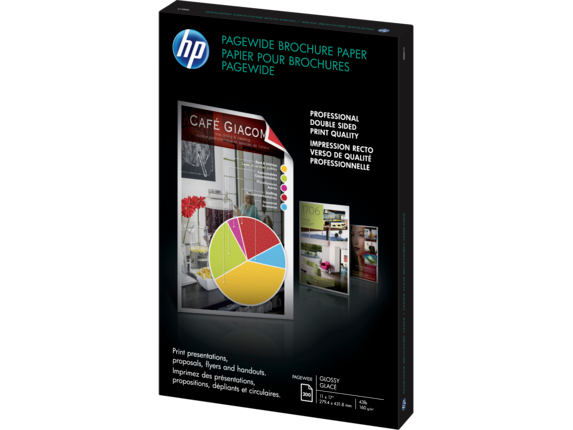 HP makes it easy to create your own color marketing and sales materials with this professional, heavyweight paper designed specifically for inkjet printing. Turn your printer into your marketing go-to with bright-white, heavyweight brochure paper. 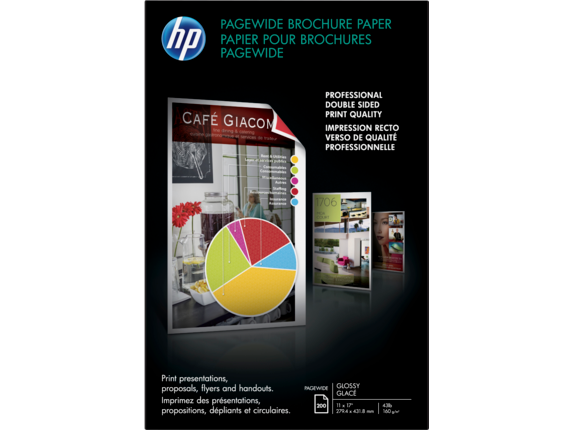 Produce professional-quality flyers, handouts, and brochures with paper crafted specifically for HP PageWide printers. Produce professional-quality flyers, handouts, and brochures right from your office with heavyweight, double-sided glossy brochure paper crafted specifically for HP PageWide printers. Ideal for marketing-department administrators or company procurement for businesses using HP PageWide printers. 1 Forest Stewardship Council® (FSC®) License Code FSC®-C017543. When you need to preserve all your precious memories on paper, opt for HP InkJet paper. 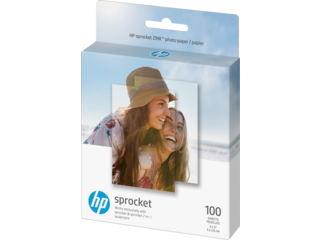 Whatever your desired size or finish, HP® carries the perfect paper to bring each moment to life. Printing a brochure for the open house you’re holding? 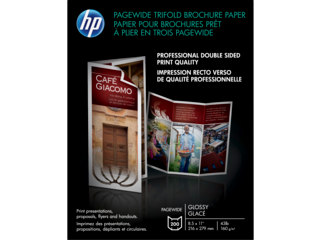 Take a look at the HP InkJet Matte Tri-Fold Brochure paper to wow all your potential customers. Have the perfect picture of the kids to send to Grandma? 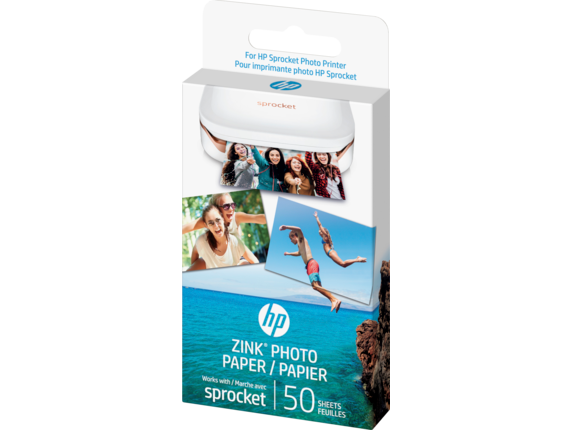 Turn every photo into a treasured gift with HP Everyday Glossy Photo paper. When you pair HP InkJet paper with one of our exceptional HP InkJet printers, you’ll always get the deepest blacks and most vibrant colors so your project practically pops off the page. Calling all social media enthusiasts! It’s time to get creative and bring all your favorite digital pics into the physical world. 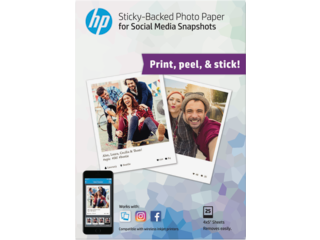 With HP Social Media Snapshots Removable Sticky Photo Paper, you can turn all your most elaborate selfies into decorative 4 x 5-inch prints. From Sunday brunch to your travels in Southeast Asia, these easy peel-and-stick prints are totally removable so you can continuously add to your growing photo collage. 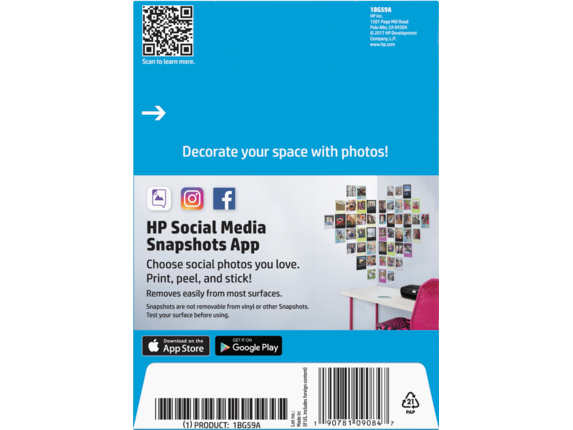 Perfect as dorm room decor or personalized party favors, you can manage each print through the HP Social Media Snapshots app when you want an extra layer of customization. 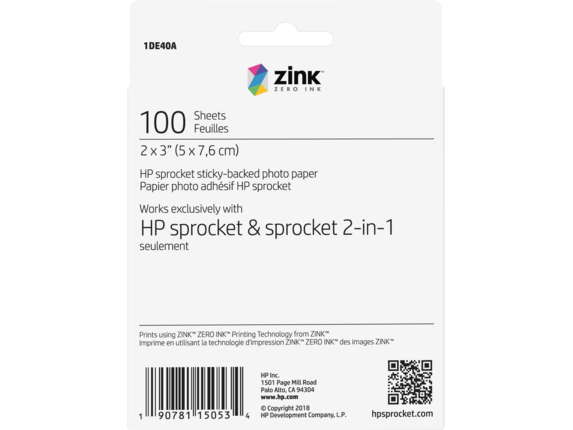 If you love printing while you’re out-and-about with the HP Sprocket, then it’s time to stock up on HP ZINK™ Sticky-Backed Photo Paper. These sweet 2 x 3-inch prints are ready in a flash no matter how far you roam from home. 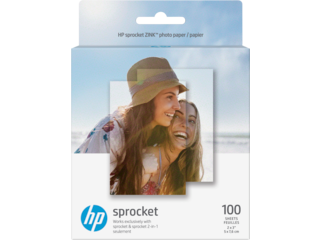 Plus, the smudge-resistant and waterproof paper ensures each memory will stay intact for years to come. 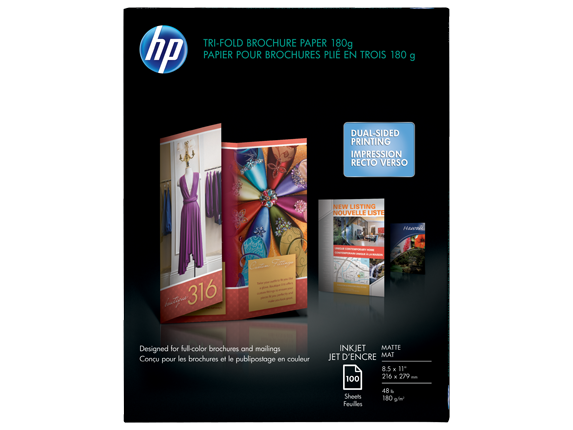 Unleash your imagination with the vibrant colors of our HP InkJet printer paper. Gone are the days of washed-out tones. 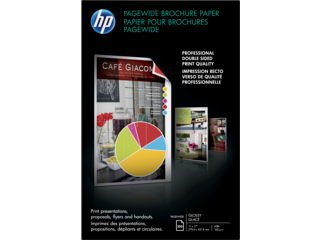 HP® delivers quality paper that captures the true colors of each project you create. Preparing for a special event? Send out customized save-the-date cards to excite all the guests. The HP Card and Invitation Kit makes it easy to craft beautiful invites that look professionally made. Experience the same jaw-dropping range of colors on all the documents you print at work. When you’re trying to impress a new client, present them with bold material to seal the deal. HP Premium InkJet Matte Presentation Paper guarantees each pie graph and infographic are beautiful enough to hang in a museum. If you want to print stunning borderless photos for the family scrapbook, there’s plenty of different glossy photo paper to choose from. 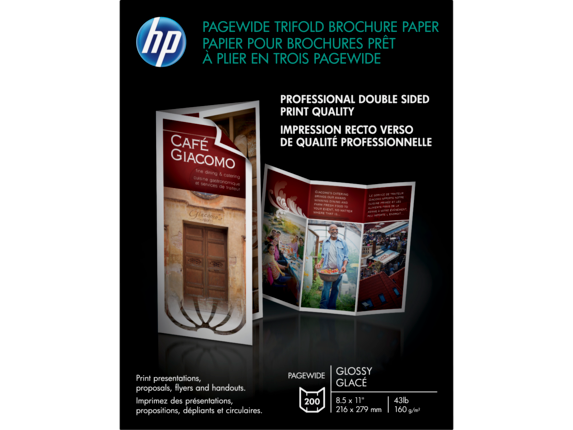 Whether you enjoy the instant-dry quality of the HP Advanced Glossy Photo Paper or the luxurious look of HP Premium Plus Soft-Gloss Photo Paper, you’ll get vivid color every time. Each image expresses a unique moment in time, so it’s important to print it in just the right size. Does your photo capture a moment that’s larger than life? 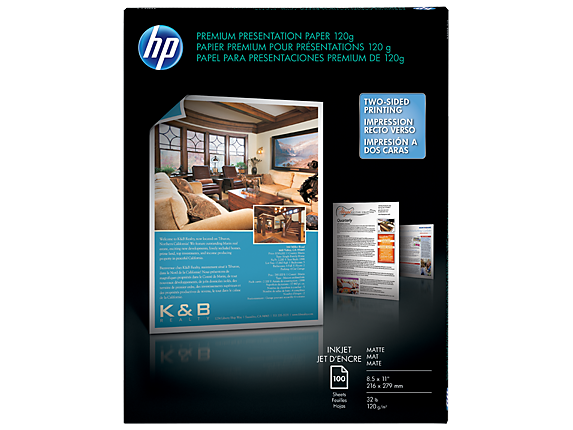 Do that incredible memory justice by printing it on 13 x 19-inch HP Advanced Glossy Photo Paper. This gallery-quality paper is ideal for framing and resists fading for more than 200 years. Whether you’re a professional photographer or a relative novice, your snapshots are worth the extra size. Did your husband quietly snap a sweet moment between you and the kids? Opt for a standard 4 x 6-inch print to set next to your bed so you can wake up and smile each morning. 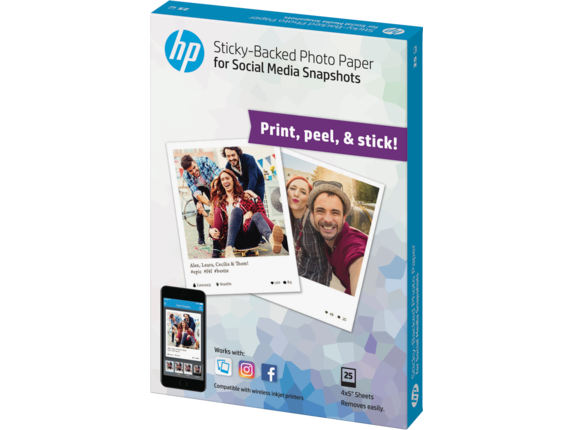 The thick, heavyweight quality of HP Premium Plus Glossy Photo Paper ensures you can move that beloved picture from frame to frame without worrying about accidental tears. What about the moment you photographed your 70-year-old uncle walking in to his surprise party? Fill the room with that emotion once more when you choose a bold 8.5 x 11-inch print. This size is often the best budget-friendly choice for customers who want to get the most bang for their buck. Achieve the same great artistic results without draining the bank. 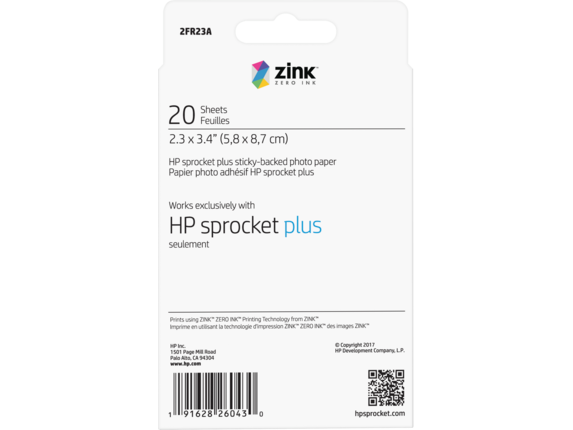 No matter how many different sizes or finishes you try, rest assured that each paper pack is compatible with an inkjet printer so you never experience any issues with inconsistency. For those who want to keep the environment in mind, several varieties of paper are made with FSC-certified mixed fibers from sustainable forests, making it incredibly easy to recycle. 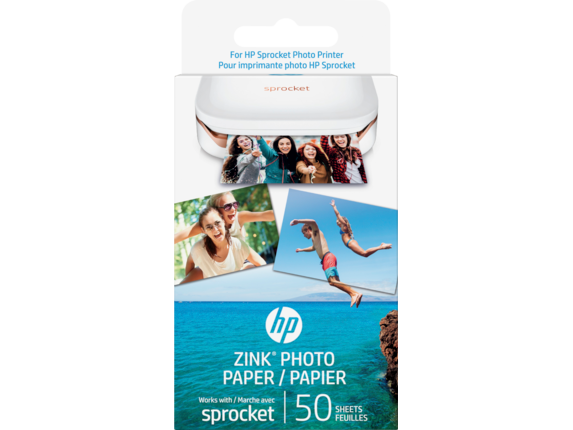 Crisp, colorful photos are just moments away when you choose to print with HP InkJet paper.